Hope you are having a good start to your week and not caught up in this major storm like we are here! If you are, I hope you stay safe and keep a mindful eye on that sky. 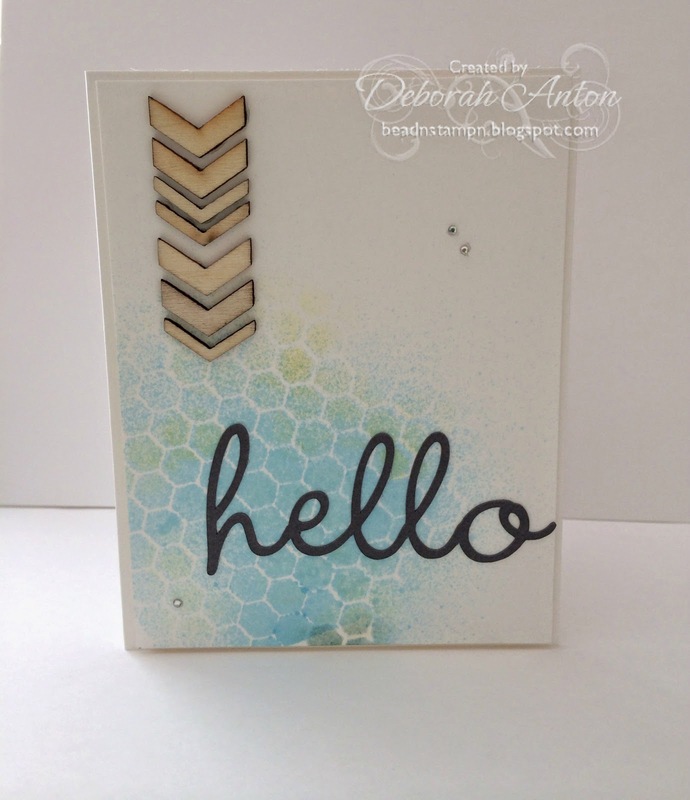 I made another CAS card for the Simon Says Stamp challenge. This was such an easy 10 minute card and I love being able to whip one out that quick. How about you? 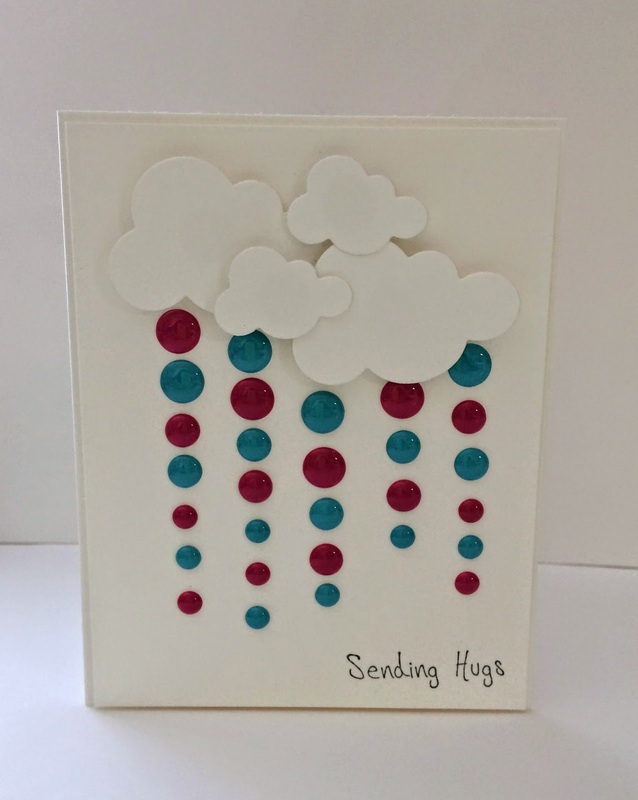 Are you a quick card maker or one who can spend hours on making one card? I started with some basic white heavy cardstock for the base and top layer. I then added a doily and some fun washi tape over that, finishing it off with some rhinestones, YNS Gumdrops, and a crochet and paper flower. That panel was then popped up over the base. Easy peasy! I am entering this into Simon Says Stamp challenge. I hope you all are having a great day so far and can see Friday up ahead! 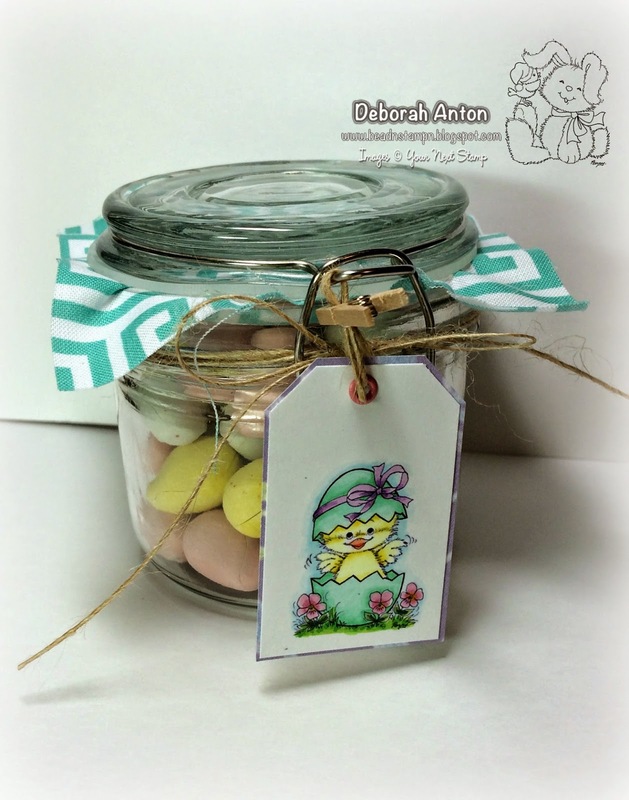 I have a CAS card to share with you all today using Your Next Stamps fun Gumdrop Embellishments. 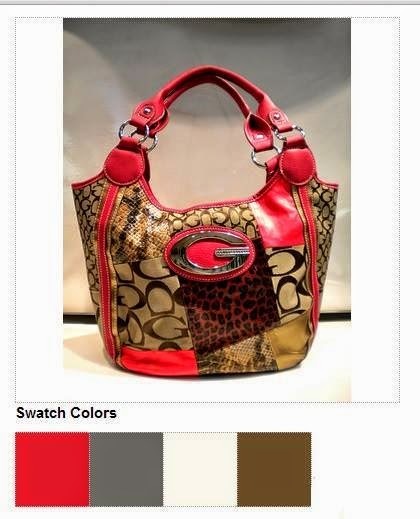 They come in a wide array of colors and there is so much you can do with them!! They even come in sparkly colors. And who doesn't need a little sparkle in their day?! I started with some heavy cardstock by Recollections and used Your Next Stamp's cloud dies for the clouds which I popped up. I then used the Gumdrop embellishments as the raindrops in Blue Raspberry and Strawberry . I finished off the card with a sentiment from Handwritten Sentiments, perfect for a pick me up to someone who may either be under the weather or just a little blue. I hope this inspired you a little today to do more with your embellishments! Thanks for popping in and checking it out! Have a great Wednesday! 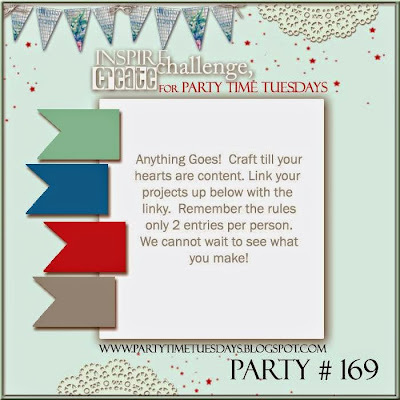 Today is another fun challenge over at Party Time Tuesday and this weeks challenge is Anything Goes! Be sure to head over to Party Time Tuesday for the full rules and to link up your fabulous creation and to check out the DT's inspiration for this weeks challenge! Here is a stenciled birthday card using watered down acrylic paint to create a fun background for a card. You can find the full instruction and details here. 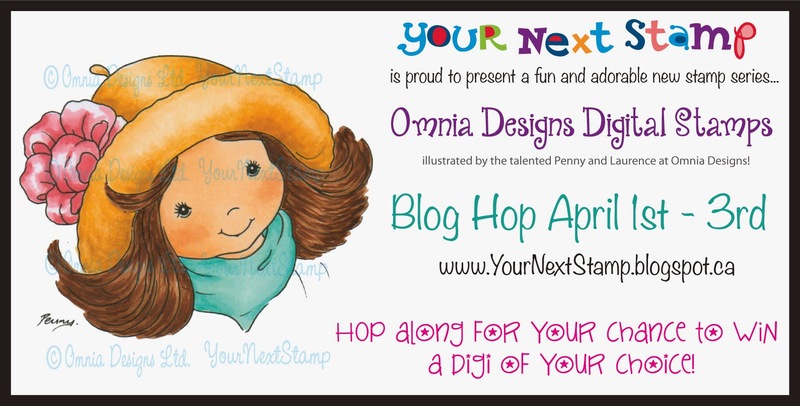 Just a quick card to share with you using Your Next Stamp's April digi release of Anna. She is darling and this image can be used in various themed cards you may want to do. I printed Anna on some Neenah cardstock and colored her in with Copics. I punched her out with my never-used Marvy large scallop punch and popped her up over some patterned paper from Cosmo Crickets Tea for Two. The scallop strip was made using my MS punch and layered with more patterned paper. The sentiment is from YNS set of Handwritten Sentiments, perfect for any occasion! I finished off the card with some fun sparkly gumdrops you can also find over at YNS. Thanks for popping in and taking a peek! Have a great Monday! Today is another Friday Fun Project at YNS! 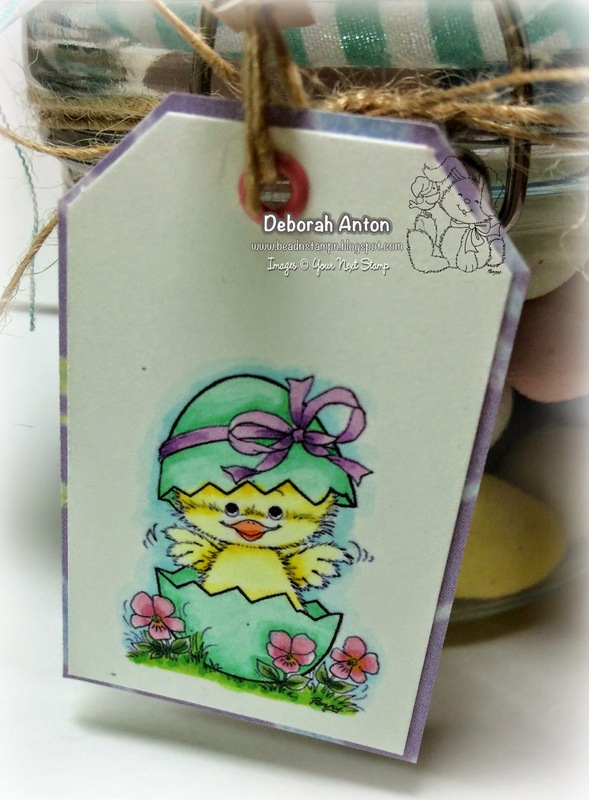 I used an adorable digi called Chirp to be used on a tag for a teachers gift. Be sure to check out the other fun and fabulous Friday projects at YNS! Thanks for stopping by! I know it has been uber quiet around here lately! With our house on the market getting ready to move this summer, we have been busy with preparing the home and every once and in a while, we are kicked out for a few hours too! :) I am doing my best to stay afloat and keep creating! I sure miss it on a daily basis. Today, I have a card to share with you that I submitted for publication but unfortunately, was rejected. 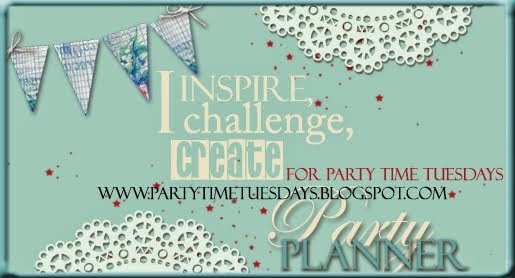 I also gave a sneak peek on the Party Time Tuesday blog today. I had a lot of fun creating this. Masking, veneer, and colored sprays are all the rage and I jumped on board. Speaking of colored sprays... no need to spend a ton of money on these sprays when you can make your own with some inexpensive acrylic paint, water, some twinkling H2O if you want sparkle, and a mini spray bottle. Just mixed enough paint with some water until you achieve the color depth you want. I used a mask from Crafters Workshop of chicken wire and used some washi tape to hold it in place to where I wanted it. Then I used my watered down acrylic paint to spray the blue in the areas I wanted it. TIP: I found that masking on a larger panel for your card is easier and then you can cut it to size. With the mask still in place, I sponged in some other colors where I wanted additional depth. My veneers were of chevrons and I used some Glossy Accents to adhere the wood to the panel pointing down to the sentiment. The sentiment was cut using my Silhouette Cameo and dotted with more glossy accents to glue it into place. The card was finished out with some rhinestones and popped up over the card base. I hope you are a little inspired to get "mixed up" with some mixed media! Thanks for stopping by and hope you have a fabulous Thursday! Be sure to check Party Time Tuesdays Your Daily Dose out! It's all about dies! Link up for your chance to win! It's the end of the week blogger friends! Yay!! I hope you all had a good one and now ready to enjoy some weekend time. Be sure to stop by and take a peek at the other fun projects members of the DT have created! Thanks so much for stopping by today and enjoy your Friday! Well, not a literal party planner, but I want to share the news that I am now on the Party Time Tuesday Design Team! Have your partied over at their awesome blog for your chance to win awesome sponsored prizes? Be sure to check them out and play along! Isn't this a great combination? My take on the challenge is this fun card I made a while back. You can check it out here. Welcome to the April YNS Digital New Release! We are so happy to have you join us as we showcase our new images from Penny and Laurence of Omnia Desgins!! I printed the image on some Neenah cardstock and colored it in with Copics. 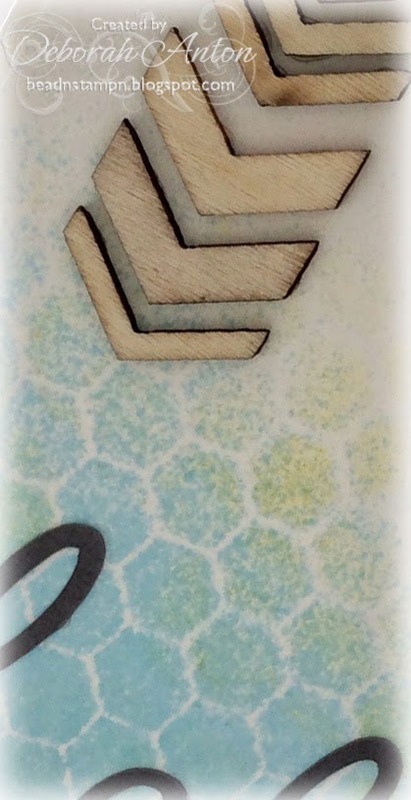 I used my nesties circle dot scallop die to cut out the image, and while it was still in the die, I sponged lightly around it. The patterned paper is Cosmo Crickets' Tea Room which I layered over some SU! cardstock in Pretty in Pink. The image is popped up over the ribbon treatment that is some crinkled satin and finished with a purple paper flower in the center of the bow. There is an awesome deal going on right now at YNS that you do not want to miss!